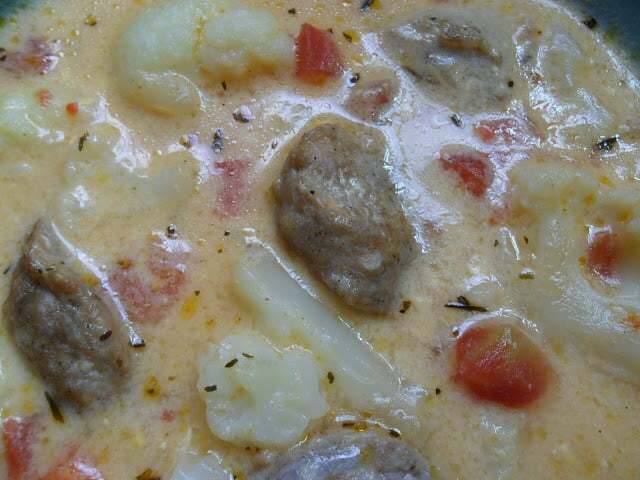 The perfect comfort food is soup and Cheesy Cauliflower Bratwurst Soup is the answer. 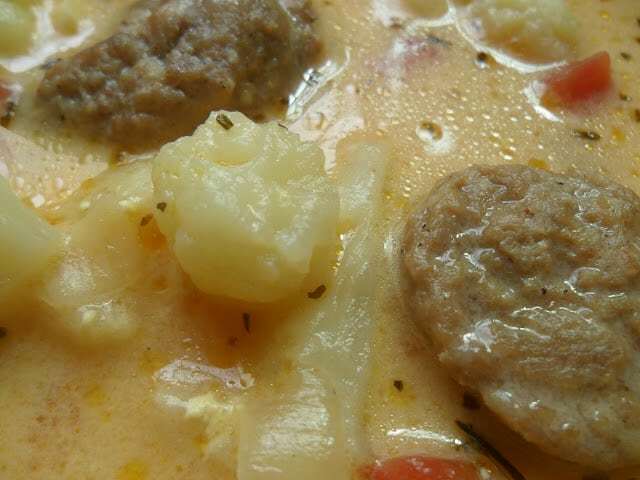 This soup is made with two Wisconsin favorites, bratwurst and cheese. Feel free to substitute ground pork, sausage or even ground beef for the bratwurst but here in Wisconsin, there is never a shortage of bratwurst so of course that’s what we used. In fact in Wisconsin, there is never a shortage of cheese either. Before you get mad and leave, hear me out, please. I know your probably thinking, she lives in Wisconsin, America’s Dairyland and she’s using Velveeta cheese?!? Well, I never! Besides using Velveeta, this recipe also calls for one can of condensed fiesta cheddar cheese soup. I can hear the screams and groans from here, she’s using processed cheese and a can of condensed soup?!? Outrageous! The reason why I use Velveeta cheese in many recipes, is really a simple one, Velveeta cheese melts beautifully. When Velveeta is combined with condensed cheddar cheese soup and/or shredded cheddar cheese, the result is delicious and creamy. Shredded cheese alone, especially in a soup recipe, can become clumpy, greasy even and often separates. That’s why I use Velveeta cheese in combination with other cheeses in soup and dips. Heat oil in large skillet over medium heat, add onion and garlic, saute for 5 minutes. Add sliced bratwurst, season with liquid smoke, salt and pepper. Saute' until browned on both sides, remove from heat and set aside. 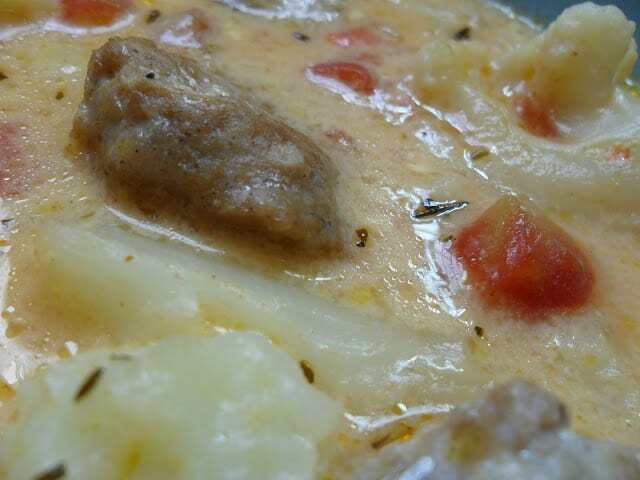 In large dutch oven or soup kettle add water, cheddar cheese soup, diced tomatoes, chicken broth, basil, parsley, thyme, creole seasoning and hot sauce. With slotted spoon, transfer brat mixture into soup kettle. Bring to a boil, reduce heat, simmer for 30 minutes. Add cubed Velvetta cheese and stir until melted. Add steamed cauliflower and shredded cheddar cheese, stirring gently. Products used to make this soup: Velveeta Cheese and Campbell’s Soup. Hi~ Thanks so much for stopping by! I am making this as I type; its at the boiling stage. Substituting broccoli for the cauli, and repurposing some leftover brats from Saturday's college team cookout, where of the 90 boys on the team, like 10 showed up. I didn't add the hot sauce or liq smoke, but i think it will still be ultra yummy! Thanks for sharing the recipe! I'm in Wisconsin too, New Holstein.